So where did this all come from? How long has all this debate over hot and wet? versus a dipped and sweet been going on? Just questions, to be sure. And to be honest, we don’t really know. Chicagoans tend to be quite stubborn when it comes to their food, and the people who claim to be responsible for introducing this delicious creation to the Second City and, indeed, to the rest of the world all stick by their stories. And one thing is for certain: the Italian beef sandwich will not be found anywhere in Italy. Nevertheless, we here at ItalianBeef.com feel that a short history of this delicious sandwich is necessary. To ignore the great history of the Italian beef sandwich would not only be a disservice to the fine companies that have put Chicago-style Italian beef on the map, but it would be a betrayal of the legacy of the fine individuals who helped to establish the Italian beef’s position in culinary history. As such, we do not claim to have the final answer as to “Who created the Italian beef?” Instead, we will tip our hats to all the contenders for the title. For without them, the Italian beef sandwich would not be where it is today: in our stomachs, and in our hearts. Having won numerous accolades over the years for “Chicago’s Best Beef” it is not surprising that Al’s #1 Beef also lays claim to being the originator of the Chicago beef sandwich. And indeed, since the first Al’s Beef opened in 1938, it could be possible! Al’s Beef was started by Al Ferreri, his sister Frances, and her husband, Chris Pacelli, Sr. at the start of World War II. 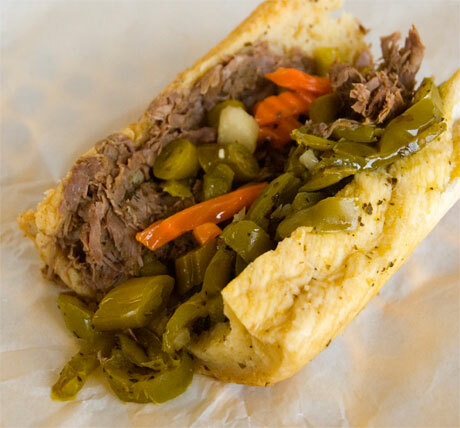 Similar to the Scala’s story, the Ferreris claim that the Italian beef sandwich was started in response to Italian weddings needing to stretch a small amount of food a long way. This is why Italian beef sandwiches typically use meat sliced as thinly as possible. 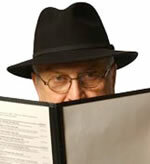 History #2: Pat Bruno and the “Mystery Chef”? Pat Bruno, dining critic for the Chicago Sun-Times, has his own account of where the Italian beef came from, and it would be remiss of us not to include it here. Bruno points out that beef was extremely rare in Italian immigrant kitchens at the turn of the century, and asserts that the sandwich clearly is a direct descendent of the French Dip, introduced in Los Angeles (shudder) in 1918. Bruno contends that beef was pretty rare in Italian kitchens up into the1950s, and as such, earlier claims to inventing the sandwich are questionable. Of course, Bruno does have his own idea as to who invented the sandwich, and it is to a man known only as “Tony” that he gives credit. Tony worked in a Greek diner, of all places, around 1948 or 1949. Believing the restaurant’s French dip sandwich to be rather bland, Tony messed around with the recipe, threw in some of his ancestors typical spices, and voila! (or whatever the Italian version of (voila! would be), the Italian beef sandwich was born. Of course, in true fairy tale style, the cook was promptly fired by a jealous owner, but Tony went on to start his own Italian-beef stand, and the rest is history. If you have eaten an Italian Beef in Chicago, then in all likelihood you have tasted a Scala beef product. For over 75 years, this Chicago mainstay has supplied Italian beef, along with many other meat packing products, to restaurants and consumers. In addition, the Scala Packing Company maintains that it was their founder, Pasquale Scala, who invented the Italian beef sandwich. 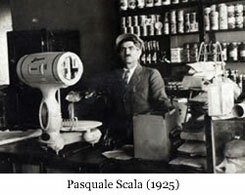 According to their company history, Pasquale Scala set up shop in an old bakery on South Western Avenue just after World War I. As the popularity of his meats grew, he established the Scala Packing Company in 1925 on Harrison Street. Then, when the Depression hit, the Scala Packing Company helped to introduce consumers to ways to stretch their food dollar. For large-scale events such as weddings, beef would be sliced thinly, covered with gravy, and served on rolls. And of course, the Italian beef sandwich was born. While this claim to the origin of the Italian beef sandwich is debated by some, there is no denying the impact that Scala’s has had on this particular recipe and on Chicago as a whole. On any typical day driving around Chicago, one can still see Scala’s trucks making deliveries to the many beef stands and Italian restaurants located throughout the city. 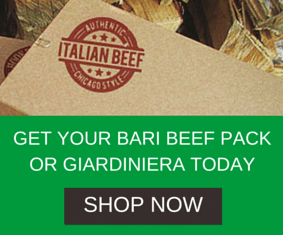 Many foodies and beef aficionados do agree that when people think of Italian beef, they usually are thinking of a sandwich that uses Scala’s beef.